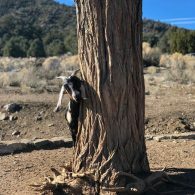 Angeles Crest Creamery is a working goat dairy on 70 private acres of chaparral and pinon-juniper woodland in the San Gabriel Mountains National Monument just 90 minutes North of Los Angeles. We also raise chickens and game birds for meat and eggs, and have a very sweet donkey named Henry. Special Instructions: The cabin includes 2 twin beds (trundle style), a sink with hot water, a mini fridge, and a hot plate. There is a shared toilet for campers a few hundred feet away. Special Instructions: Base price of $99 per night for up to 4 people. Up to 25 additional people are allowed at $20 per person, per night.